Rom Kristiansen told Denmark's TV2 channel he was checking out a story his grandfather had told about a Nazi Germany plane that had crashed nearby in 1944. 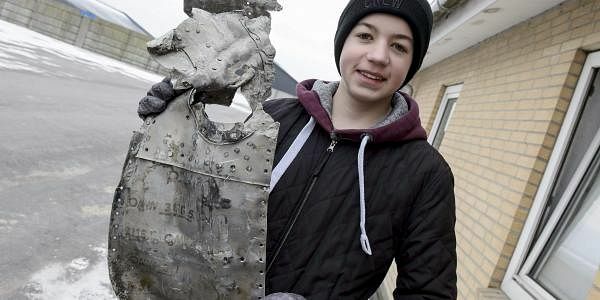 COPENHAGEN: A Danish teenager has found parts of a German World War II airplane that likely crashed in a northern Denmark swamp 72 years ago including the remains of a man who might have been its pilot. Local archaeologist Torben Sarauw said today that 14-year-old Daniel Rom Kristiansen used a metal detector to make "the fantastic finding," adding the parts lied five to six meters (yards) underground. Rom Kristiansen, who was not immediately available for comment, told Denmark's TV2 channel he was checking out a story his grandfather had told about a Nazi Germany plane that had crashed nearby in 1944. Soeren Flensted, a WWII historian specialized in German airplanes, said the pilot might have been someone with little experience who was on a training mission. "There are records that someone in northern Denmark crashed into a mire in November 1944, and it would be impossible to get him up," Flensted said. "So that could be him." Sarauw said a team also unearthed a German Luftwaffe uniform and bones plus personal items including three condoms and cigarette rolling paper. A local museum is investigating the engine, guns and twisted fuselage parts from the wreck, Sarauw said. Danish police took the bones for investigation. Marko Naoki Lins, a spokesman for Germany's embassy in Copenhagen, said a German organization that takes care of war graves and keep records of deceased German WWII soldiers was helping out with identifying the pilot. Germany invaded the Scandinavian country in 1940 and Denmark was liberated from Nazi occupation on May 5 1945.